Wallace Fitzgerald Beery (April 1, 1885 – April 15, 1949) was an American film actor. He is best known for his portrayal of Bill in Min and Bill opposite Marie Dressler, as Long John Silver in Treasure Island, as Pancho Villa in Viva Villa!, and his titular role in The Champ, for which he won the Academy Award for Best Actor. Beery appeared in some 250 movies during a 36-year career. His contract with Metro-Goldwyn-Mayer stipulated in 1932 that he would be paid $1 more than any other contract player at the studio, making him the highest paid actor in the world. He was the brother of actor Noah Beery Sr. and uncle of actor Noah Beery Jr.
For his contributions to the motion picture industry, Beery has a star on the Hollywood Walk of Fame at 7001 Hollywood Boulevard. Beery was born in Clay County, Missouri, near Smithville. The Beery family left the farm in the 1890s and moved to nearby Kansas City, Missouri, where the father was a police officer. 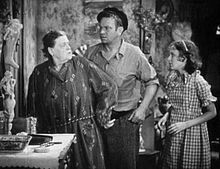 Wallace Beery joined his brother Noah in New York City in 1904, finding work in comic opera as a baritone and began to appear on Broadway as well as summer stock theatre. His most notable early role came in 1907 when he starred in The Yankee Tourist to good reviews. In 1913, he moved to Chicago to work for Essanay Studios, cast as Sweedie, a Swedish maid character he played in drag. Later, he worked for the Essanay Studios location in Niles, California. In 1915, Beery starred with Gloria Swanson, whom he married the following year, in Sweedie Goes to College. Beery began playing villains, and in 1917 portrayed Pancho Villa in Patria at a time when Villa was still active in Mexico. Beery reprised the role 17 years later in Viva Villa! Wallace Beery’s notable silent films include Arthur Conan Doyle‘s dinosaur epic The Lost World (1925; as Professor Challenger), Robin Hood with Douglas Fairbanks (Beery played King Richard the Lionheart in this film and a sequel the following year called Richard the Lion-Hearted), The Last of the Mohicans (1920), The Round-Up (1920; with Fatty Arbuckle), Old Ironsides (1926), Now We’re in the Air (1927), The Usual Way (1913), Casey at the Bat (1927), and Beggars of Life (1928) with Louise Brooks. Beery’s powerful basso voice and gruff, deliberate drawl soon became assets when Irving Thalberg contracted him to Metro-Goldwyn-Mayer as a character actor during the dawn of the sound film era. 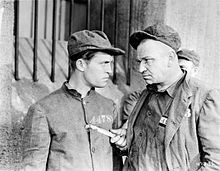 Beery played the savage convict “Butch”, a role originally intended for Lon Chaney Sr. in the highly successful 1930 prison film The Big House, for which he was nominated for the Academy Award for Best Actor. The same year, he made Min and Bill (opposite Marie Dressler), the movie that vaulted him into the box office first rank. 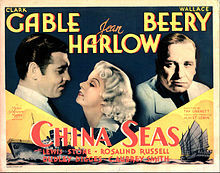 Other Beery films include Billy the Kid (1930) with Johnny Mack Brown, The Secret Six (1931) with Jean Harlow and Clark Gable, Hell Divers (1931) with Gable, Grand Hotel (1932) with Greta Garbo and Joan Crawford, Tugboat Annie (1933) with Dressler, Dinner at Eight (1933) opposite Harlow, The Bowery with George Raft, Fay Wray, and Pert Kelton that same year, China Seas (1935) with Gable and Harlow, and Eugene O’Neill‘s Ah, Wilderness! (1935) in the role of a drunken uncle later played on Broadway by Jackie Gleason in a musical comedy version. During the 1930s Beery was one of Hollywood’s Top 10 box office stars; it was during the early part of this period, in 1932, that his contract with MGM stipulated that he be paid a dollar more than any other contract player at the studio, making him the world’s highest paid actor. Beery starred in several comedies with Marie Dressler and later, after Dressler’s death, Marjorie Main, but his career began to decline in the 1940s. In 1943 his brother Noah Beery Sr. appeared with him in the war-time propaganda film Salute to the Marines, followed by Bad Bascomb (1946) and The Mighty McGurk (1947). He appeared mostly in Westerns during his final decade and he remained top-billed. None of Beery’s films during the sound era lost money at the box office; his movies were particularly popular in the Southern regions of the United States, especially small towns and cities. Beery’s first wife was teenaged actress Gloria Swanson; the two had co-starred in Sweedie Goes to College (1915) and married in 1916. Although Beery had enjoyed popularity with his Sweedie shorts, his career had taken a dip, and during the marriage to Swanson, he relied on her as a breadwinner. According to Swanson’s autobiography, Beery raped her on their wedding night, and later tricked her into swallowing an abortifacient when she was pregnant, which caused her to lose their child. In December 1939, the unmarried Beery adopted a seven-month-old infant girl Phyllis Ann. Phyllis appeared in MGM publicity photos when adopted, but was never mentioned again. Beery told the press he had taken the girl in from a single mother, recently divorced, but he had filed no official adoption papers. Child actors, in particular, recalled unpleasant encounters with Beery. Jackie Cooper, who made several films with him early in his career, called him “a big disappointment”, and accused him of upstaging, and other attempts to undermine his performances, out of what Cooper presumed was jealousy. He recalled impulsively throwing his arms around Beery after one especially heartfelt scene, only to be gruffly pushed away. Child actress Margaret O’Brien claimed that she had to be protected by crew members from Beery’s insistence on constantly pinching her. Rooney remained an exception to the general negative attitude among child actors. 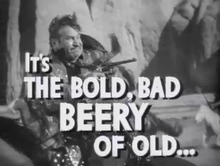 In his memoir he described Beery as “… a lovable, shambling kind of guy who never seemed to know that his shirttail belonged inside his pants, but always knew when a little kid actor needed a smile and a wink or a word of encouragement.” He did concede that “not everyone loved as much as I did.” Beery, by contrast, described Rooney as a “brat”, but a “fine actor”. Beery owned and flew his own planes, one a Howard DGA-11. On April 15, 1933 he was commissioned a Lieutenant Commander in the United States Navy Reserve at NRAB Long Beach. One of his proudest achievements was catching the largest black sea bass in the world off Santa Catalina Island in 1916, a record that stood for 35 years. A noteworthy episode in Beery’s life is chronicled in the fifth episode of Ken Burns‘ documentary The National Parks: America’s Best Idea: In 1943, President Franklin D. Roosevelt signed an executive order creating Jackson Hole National Monument to protect the land adjoining the Grand Tetons in Wyoming. Local ranchers, outraged at the loss of grazing lands, compared FDR’s action to Hitler’s taking of Austria. Led by an aging Beery, they protested by herding 500 cattle across the monument lands without a permit. Wallace Beery died at his Beverly Hills, California home of a heart attack on April 15, 1949. He was interred at Forest Lawn Memorial Park in Glendale, California. The inscription on his grave reads, “No man is indispensable but some are irreplaceable.” When Mickey Rooney’s father died less than a year later, Rooney arranged to have him buried next to his old friend. “I thought it was fitting that these two comedians should rest in peace, side by side,” he wrote. 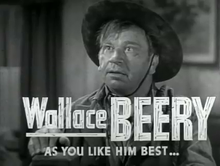 For his contributions to the film industry, Wallace Beery was given a star on the Hollywood Walk of Fame at 7001 Hollywood Boulevard. Hollywood Steps Out (1941), left to right: William Powell, Spencer Tracy, Ronald Colman and Errol Flynn. Seated: Wallace Beery and C. Aubrey Smith. This Man’s Navy (1945) with Noah Beery Sr.